First up, the much-awaited Baker book. Simply cannot contain self. And yes, it would seem that I'd need far more than a week of packed-full vacation days in DC to complete all this delectable reading. But it's all there...just in case. I'll admit that when I first started on this travel writing reading jag, I didn't know if it had legs. Translation: I doubted it could capture my interest beyond the first book or two. Add in the bevy dearth of very excellent new fiction that is coming out over the next few months, and I seriously wondered how long I'd manage to be intrigued by this genre of writing and this ever-seeking out of new place/old place understanding and adventure. So I'm entirely surprised to find that not only has Theroux completely enchanted me with his very specific point of view in Dark Star Safari, but I'm becoming ever more interested in devouring all sorts of travel literature as the days pass. That's the good news. The less good news is that I'm now at a decisive moment. I could give myself entirely over to Theroux and read all of his big travel books in one go (there is something about his writing that carries me along and piques my interest whether I agree with him entirely or no and I can see that this might be an excellent time to become a Theroux non-fiction completist) or I can hop skip jump around to all the other journey lit that I've been obsessively identifying, collecting and placing in library queues. As you know, bookstore readings are my thing (or at least they were before I started working so many hours a week that I find the last one I attended was eight months...eight months...ago) and I find the whole process fascinating -- from the reading itself to the audience's odd mannerisms and secret but not so secret conversations both before and after the author's part of the gig is over. On the heels of both my grave disappointment at my recent track record for attending these events (I used to attend several per week so to say I'm out of sorts is to grossly understate this state of affairs) and my recent foray into journey-from-your-armchair-literature, I'm now considering kick-starting my anemic author-event attendance by showing up at...a business conference. I know. Whilst checking out the Triple Pundit and thinking about my secret sustainable wine project (which is also suffering from my crazy workload), I took a look at the Opportunity Green conference that will take place Nov 7 - 9th at UCLA. After perusing the sponsors and speakers (MINI, I love you), I was delighted to see that Rick Ridgeway, author of The Shadow of Kilimanjaro: On Foot Across East Africa (which I finished a few short weeks ago and which inspired me to dive headlong into this reading direction), will be speaking in his role as VP of Environmental Programs and Communication at Patagonia. Not my ideal author venue, but I'm willing to check it out. It is rare for me to be only pages - mere pages - into a book and scold myself for having missed out on such greatness for so long. How could I have missed Theroux's travel writing entirely? It would be one thing if I didn't obsess about books daily...but to be so focused on writing and reading and to have missed this entire oeuvre of Theroux is just...maddening. More worrisome: have others? The good news: I've discovered he writes more than novels, and boy does he ever. It is early going, but I suspect his work will lead me on a fascinating journey. In addition to the work itself, I've already had a few of those extra-lovely moments where connections to other writers/folks of interest are made - writers that have either been on my list for a long time or those who've only recently come to my attention but now seem to appear in everything I read (which I always interpret as a message from the book universe that I must follow the tail as it darts in and out of whatever I'm reading and see where it takes me). "Out of touch in Africa was where I wanted to be. The wish to disappear sends many travelers away. If you are thoroughly sick of being kept waiting at home or at work, travel is perfect: let other people wait for a change. Travel is a sort of revenge for having been put on hold, having to leave messages on answering machines, not knowing your party's extension, being kept waiting all your working life - the homebound writer's irritants. Being kept waiting is the human condition. Travel in the African bush can also be a sort of revenge on cellular phones and fax machines, on telephones and the daily paper, on the creepier aspects of globalization that allow anyone who chooses to get his insinuating hands on you. I desired to be unobtainable. Kurtz, sick as he is, attempts to escape from Marlow's riverboat, crawling on all fours like an animal, trying to flee into the jungle. I understood that. I was going to Africa for the best reason - in a spirit of discovery; and for the prettiest - simply to disappear, to light out, with a suggestion of I dare you to try and find me." It started with meeting a wolf expert, grew stronger with a bookshelf reorg in which I rediscovered my once-loved photo books on Africa, and swelled into grand proportions after I started watching a little show called...Man vs. Wild. Say what you will about Bear Grylls and how likely it is that he is truly in danger during each shoot and so on (a quick search of YouTube on this topic would render anyone a skeptic in this regard), his fascination with the inner journey one goes through while trying to survive in the wild struck a deep nerve in me and reminded me of the epic journey literature that my father introduced to me as a child. Growing up near Jack London Square, perhaps it was a no-brainer that the first man vs. wild literature I ever read was Jack London's Call of the Wild. At the time I distinctly remember it all being a bit intense and rugged and...something possibly more suited to boys. Full disclosure, even Black Beauty was a lot of violence for me to handle at that time. Either way, I moved on to other literature and never looked back. I had torrid summer affairs with Clive Cussler's grocery store novels (my grandmother's term, not mine) and although I knew then that the writing was subpar, I gravitated towards his stories that were less spy-ops, more adventure in the wild. I had a brief spell of wanting to move to Africa to study zebras and then I spent two decades ignoring all this entirely. Yet a few back to back episodes of Man vs. Wild (thank you Netflix Watch Instantly) and all the power of epic travel writing and intense journeys that challenge everything we know and believe about ourselves and the vast natural landscapes that cover our planet came roaring back. I'm not sure if this renewed interest is more escapism from daily worries or if it is purely about the journey and the animals along the way, which was certainly the fascination when I was younger. As I've spent the last several years of my life focused on new, new fiction, my overflowing bookshelves afforded me very little in the way of a quick fix once I determined that I wanted to read some epic journeys through difficult landscapes. The first book I plucked from my shelves a few weeks ago was Rick Ridgeway's The Shadow of Kilimanjaro: On Foot Across East Africa. I'm hooked. So hooked, that I'm already casting about for what I'll read next. It was in this casting about that I disovered the vast array of travel writing - classic and brand spanking new - that I've ignored entirely with my ever-vigilant focus on new fiction. Quick scans of travel writing sections revealed Paul Theroux's books (ahhh, so that's what he does) and so many others that I felt like a right dolt for having missed out entirely (and possibly thumbed my nose at, if I'm being honest) on this genre of writing. The good news: I've found it now and it is fair to say I'll be exploring the world of epic journey literature for quite awhile. The tradition is so rich, the landscapes so vast, the life altering realizations so abundant. I've got a few books on my radar to read next (Dark Star Safari by Paul Theroux tops the list) and I'd like to consider this post a prelude to a longer discussion about this genre of literature. In my years of book blogging (and I'm stunned to find it has been four), we've never had this discussion. In all of our emails and comments and texts and tweets back and forth about craft and gorgeous writing and novels that have changed us, we've never covered any of this. Why is that? Is it a literature we've deemed somehow lesser than the great fiction we celebrate? Why do these journey stories resonate for me now in a way they never did before and have all of you been steeped in this literature for years and I'm a late arrival? These are just the first questions of what I hope will be an ongoing dialogue here at Counterbalance. I'm oh so looking forward to it. Mr. Counterbalance and I are headed to a wedding up north this weekend and are extending our stay for a week in Napa. Much as I rolled my eyes at Napa the entire time I grew up in the Bay Area, I find that while some of my angles have hardened with age, my attitude towards Napa has not. Instead, it has mellowed and since Napa itself seems almost entirely over itself (finally! ), it's a perfect time to visit. For kicks, I've thrown in Delaney's dhalgren. I could just make my life easier and bring only the dhalgren...but then I'll get antsy and feel trapped without options. While I'm steadfastly against The Kindle (for reasons I can't properly articulate) I can see its use in moments like these when I'd like to bring my entire library along for perusal...just in case. One of the best things about traveling by car through the Irish countryside is listening to the local radio - I find I can learn so much about a country by what they choose to cover on the radio. The past week of Irish radio has been a delight -- especially the bits when they talk of Irish poets and writers and play old audio of them reading their work aloud. We had a lovely day driving from Galway to Limerick yesterday and heard a two hour public radio discussion of Patrick Kavanagh, his poetry, his politics (he detested snobby scholars studying James Joyce at Trinity College) and his band of poet friends. 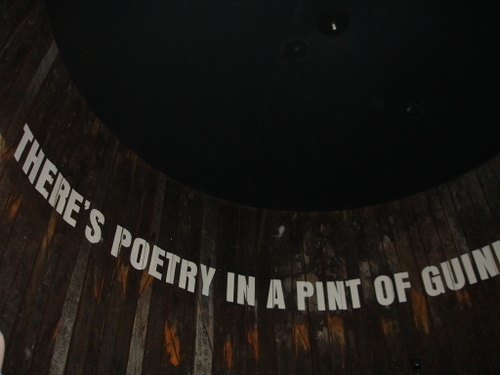 The most inspired words I've ever seen printed inside of a brewery. Ireland is slowly stealing my heart. Spent several days in Dublin and now we're on the opposite coast in Galway. Taking it slow after several very busy days packed with much goodness. Many good chats with booksellers, great pints with local writers and now we're slowing down before we get busy again.